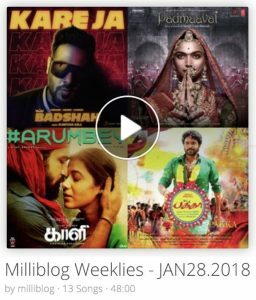 Milliblog Weeklies – JAN28.2018 by Milliblog! Kareja (Indipop): The sparse music and the repetitive hook make it almost hypnotic! The minor nuances added—at one point Badshah goes ‘Ruk mat’ and the song completely stops, only to start with Badshah berating generally, ‘Kisi ne kaha rukne ko?’—are entertaining. Nainowale ne (Padmaavat, Hindi): This is the soundtrack’s best, much better than the promo songs like Ghoomar and Ek dil, with its lilting retro’ish sound and Neeti Mohan’s fantastic vocals! The sitar (by Dhimant Varman) backdrop makes it all the more engaging and retro-style. Arumbey (Kaali, Tamil): Composer, now full-time actor, Vijay Antony springs surprises often in his music. This one, possibly Kalyani raaga based has an easily likeable melody. The orchestration is rather generic, but Nivas and Janaki Iyer’s vocals sell us this song convincingly. Izhutha izhuppukku (Pakka, Tamil): C.Sathya’s last audio release was Koditta Idangalai Nirappuga in 2016. This song is a lovely listen, with a neat faux-rural sound that’s commonplace nowadays. Shivai Vyas, though, competes with Udit Narayan, in resurrecting Tamil. Azhagae (Irumbuthirai, Tamil): Good old Yuvan Shankar Raja. That’s both a good and a bad thing. Good because, this is a very nice melody. Bad because this is literally his template that he has already exploited heavily already. But, good thing he doesn’t sing it himself. Kaadhoram (Kee, Tamil): As if to make up for the disappointment of calling a song ‘Raaja Paattu’ and having nothing to do with Raja in it, Vishal Chandrashekar has this song. The tune is reminiscent of his music in Kathalo Rajakumari, with a neat celtic chorus too! Balma (Tagaru, Kannada): It starts ominously disorienting, before segueing into the captivating ‘Balma’ hook amidst sedate electronica. It eventually scales so beautifully when Siddharth Belmannu starts his classical parts to end the song on a high. Well done, Charan! Badukina bannave (Tagaru, Kannada): This is good old Charan, handing over a lush melody to Siddharth Belmannu while he, in the background, produces an ambient cocktail to wrap the whole thing, complete with a heady folk outro. Munniloru swargam (Rosapoo, Malayalam): Malayalam film music has seen a steady influx of some really cool funk and disco songs. Sushin Shyam tries his hand on the style and gets it mostly right too, supported very well by Suchith Suresan on the vocals! Rosapoo (Rosapoo, Malayalam): Sushin picks an exotic vaudevillian sound for the title song and nails the tune and orchestration so beautifully. 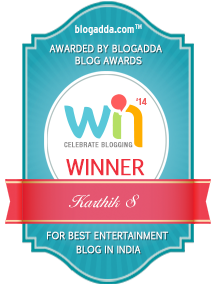 The whistling interlude and the ‘Sundari’ call out are memorable, besides Sushin’s engaging vocals. Swamy ra ra (Achari America Yatra, Telugu): A fun song! Thaman layers his own style of catchy rhythm to add to the fun and the many voices (Sri Krishna, Dhanunjay, Mohana Bhogaraju, Sahithi Chaganti), besides using familiar folk musical phrases. Nisa shalabhame (Hey Jude, Malayalam): The film has 5 songs and 4 composers! This song by M.Jayachandran is my fave. It makes tremendous use of Shakthisree Gopalan’s splendid vocals, even as the music builds gradually, sounding a bit like Serial podcast’s theme tune! Yemaindhi (Rangula Ratnam, Telugu): Composer Sricharan Pakala’s inspiration from Raja’s Ram bam bam is obvious, but he does improvise on the jazzy flavor pretty well. In particular, the differently handled anupallavi is a neat touch, as also the violin moving to a carnatic sound. Blonde balma (Mukkabaaz, Hindi): As if the variety composer Rachita Arora offers in the soundtrack wasn’t enough, there’s this deleted song too! Such a catchy & ebullient song that mixes the desi where needed, perfectly! Superbly sung by Kalpana Patowary. Samaya nodade (Churikatte, Kannada): Vasuki Vaibhav, who was very impressive in Rama Rama Re returns! Largely okay’ish soundtrack, but this song is darn good! Pleasant melody, sung well by Vasuki himself along with Supriya Lohith. Thanna thaane (Carbon, Malayalam): Vishal Bhardwaj’s Malayalam soundtrack! This is the one song that makes the cut (the other one sung by Rekha Bhardwaj doesn’t!). This is straight out of his Hindi repertoire and has the hallmark of a typical Vishal song.